Format incompatibility seems to be an eternal topic among video enthusiasts. Here is an example, when you made all efforts to add AVI file to iTunes for possibly syncing them to your iPad, nothing's gonna change. This is because iTunes' incompatibility with AVI files makes you end in failing to import AVI video to iTunes, not to mention the attempt to transfer AVI video to iPhone, iPad, iPod. An AVI to iTunes Converter is Essential! 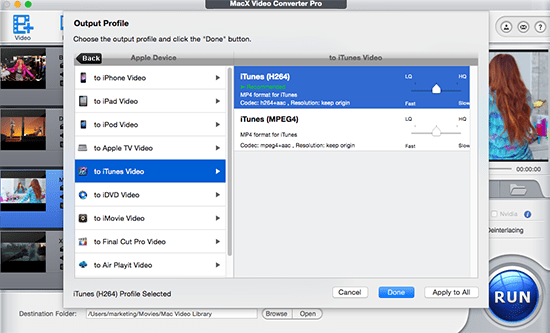 If there any noteworthy video converter to put AVI video to iTunes, MacX Video Converter Pro comes first and best. It enables you to not only convert AVI to iTunes supported video formats, namely AVI to MP4, AVI to MOV, AVI to M4V, but also transcode among other video formats like MTS, M2TS, MOD, H.264/AVC, HEVC x265, HD TS, HD MOV, WMV HD, VOB, MPEG, MP4, MKV, MOV, YouTube FLV to iTunes. Is that enough as an excellent video converter? Absolutely not. 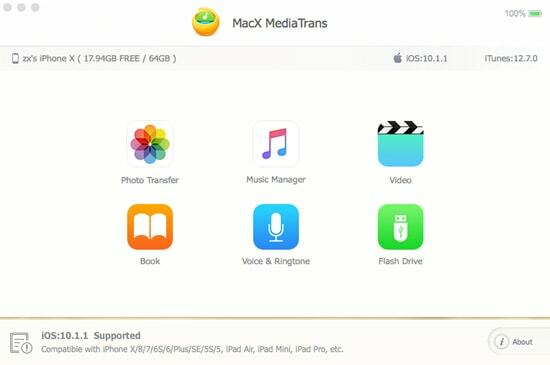 MacX Video Converter Pro delivers an unparalleled speed on AVI to MP4, MOV, M4V conversion with Intel's QSV hardware acceleration tech, with which the avi to iTunes h.264 conversion speed can reach 110fps, 5x faster than other video transcoders like Handbrake. The High Quality Engine used will guarantee 98% original quality reserved. Convert avi to iTunes mp4, mov, m4v, flv,, H265/HEVC, M4V, MKV, MTS, etc. Support source videos in 8K, 5K, 4K UHD, HD 1080P, 720P and remain top quality. Compress AVI files to small-size mp4 for iPhone, iPad, Android, Google mobiles etc. Excellent editing features like trim/crop video, add watermark & subtitle to video. World's 1st avi to iTunes MP4 converter with QSV tech, 15X faster. Free download avi movies for iTunes library from 1000+ sites, 100% clean and safe. Free download the AVI video converter on macOS (or Windows version), and launch it, drag and drop AVI files to the program. Or click "Add File" to locate AVI. After the AVI files are imported, choose "to iTunes" as output video format. For better video quality, you are allowed to adjust the video/audio settings. You can also use this video processing software to convert among 200 more formats and 420+ device profiles, iPhone iPad, Android, Microsoft, game consoles, etc. Click the "Browse" button and choose the location where you would like to save the converted files after the program finishes the video conversion. Note: to speed up the avi to iTunes H.264 converting speed, you're strongly suggested to check the box of hardware encoder on the bottom right corner of the interface. After all the settings, click "RUN" and begin to convert AVI to iTunes on Mac. When the conversion finished, you can import AVI to iTunes and sync the converted video to iPad Pro, iPad mini 4, iPhone Xs/XR/Xs Max, iPod. If you wanna free download AVI videos to iPhone X, iPad Pro, iPad Mini 4, Surface Pro, Apple TV 4,etc., this AVI to iTunes converter, as well as an video downloader is the optimum choice for you. With 1000+ video music sharing sites supported, this utility enables you to free download any video from YouTube, Facebook, Dailymotion, Vimeo, Vevo, Instagram, etc. and convert video directly to iPhones, iPads, Android, Microsoft mobile device with world's fastest speed. * Import AVI to iPhone iPad without iTunes, one click with extremely fast speed. 4. Click Conver shown on the thumbnails of the AVI files and it will automatically convert the videos to iPhone formats. Then click Sync to import avi video to iPhone iPad without iTunes. Ultimate powerful video transcoder for Mac/Windows users to convert AVI to iTunes compatible MP4 MOV M4V format for syncing to iPhone iPad. Fast & no quality loss.